Heat oven to 375°F. Grease 3-quart casserole with shortening. On large microwavable plate, microwave burgers uncovered on High 2 to 3 minutes, turning once, until thawed. Cut into 1-inch pieces; set aside. Cut eggplant into 1/4-inch slices. In 2-quart saucepan, cook eggplant in enough boiling water to cover 5 to 8 minutes or until tender. Drain in colander; set aside. In same saucepan, mix flour, salt, pepper, nutmeg, cinnamon and milk. Heat to boiling, stirring constantly. Boil 1 minute, stirring constantly. Remove from heat. Stir in cream cheese until melted and smooth. Place half of the eggplant in casserole. 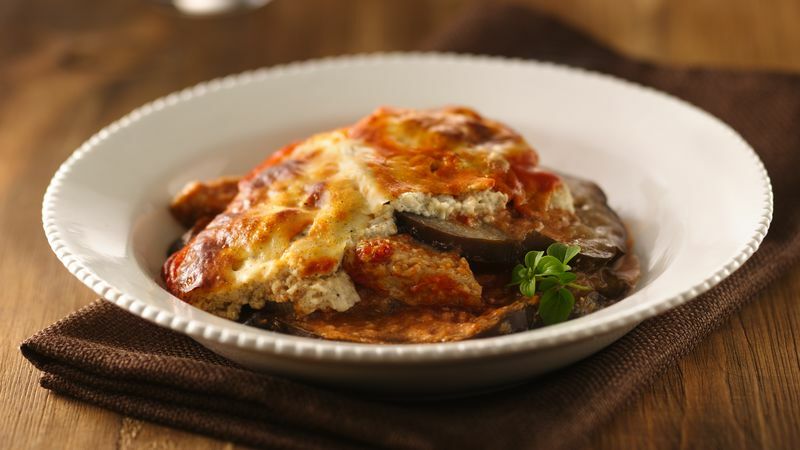 Layer with burger pieces, tomato sauce, 1 1/2 cups of the white sauce and remaining eggplant. To remaining white sauce, stir in egg product; pour over eggplant. Bake uncovered about 1 hour or until firm. Let stand 10 minutes before serving. Eggplant has been called "the vegetarian's beef" because of its meaty texture. Choose firm, even-colored eggplants that are heavy for their size and free of blemishes. Caps and stems should be intact with no mold. Refrigerate unwashed in a plastic bag up to 5 days.